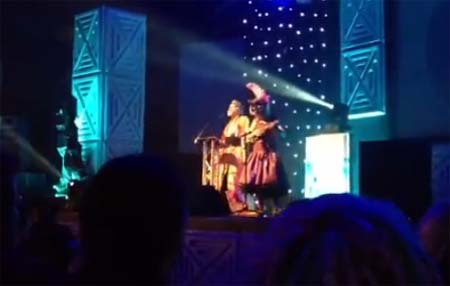 Steampunk author Robert Rankin sings out the end of the SFX Weekender with the song, ‘Perfect Day’, and, as you can see, this video captures the moment perfectly too. Yes, I’m just back from the UK’s answer to Comic-con in California, the SFX Weekender, in Wales’ Prestatyn Sands holiday camp. Big thanks to the SFX magazine team for their incredible hard work. Being in front of an audience of 1000s isn’t something I’ve had to do since I worked for Steve Jobs and he forced me to do the Apple shows. Ta to Sylvester McCoy and Eve Myles for the shocking Doctor Who gossip. As promised, my lips are sealed. Cheers to all the readers who sat in on the panels and came up and said nice things, too. You peeps are the best. Hope any of you who was there, not to mention my flatmate for the con, Joe Abercrombie, return home okay in the big freeze! Now, to mark the end of the show, today (Sunday), is the last day my novella ‘In the Company of Ghosts’ is free for download world-wide on Amazon Kindle. Agatha Witchley used to be a spy in the Cold War, but now she’s locked up in the UK’s premier maximum-security mental institution. She believes that the ghosts of the celebrity dead visit her padded cell and whisper the world’s secrets in her ears. Which is a big problem for the British government, because she’s the only one who can help them when an American billionaire is murdered in London in one of the strangest killings yet. The Home Secretary needs the case locked down and solved before the entrepreneur’s death becomes public knowledge and economic chaos ensures. The woman he has in mind for the job might be paranoid, she might be lethal, she might half-insane and drawing a pension, but it’s amazing how you can forgive that in a genius when it’s a genius’s help you need. Yes, the security forces need Agatha Witchley again. It’s just the ghosts of Churchill, Elvis and Groucho Marx they could do without. And, although it’s not free (I did ask, but HarperCollins’ MD nearly choked to death on her coffee), I should say that the last book in my Jackelian series, From the Deep of the Dark, is officially out in two weeks time. I say officially, as I have had a couple of readers pointing out that their pre-orders on the Kindle have already downloaded. The print edition is still firmly in pre-order territory, though, for at least another week. I do have some ideas for new Jackelian novels, but they’re more or less on hold while I undertake a massive new unrelated fantasy trilogy. More on this… later. « SFX Weekender… Joe Abercrombie moves in!